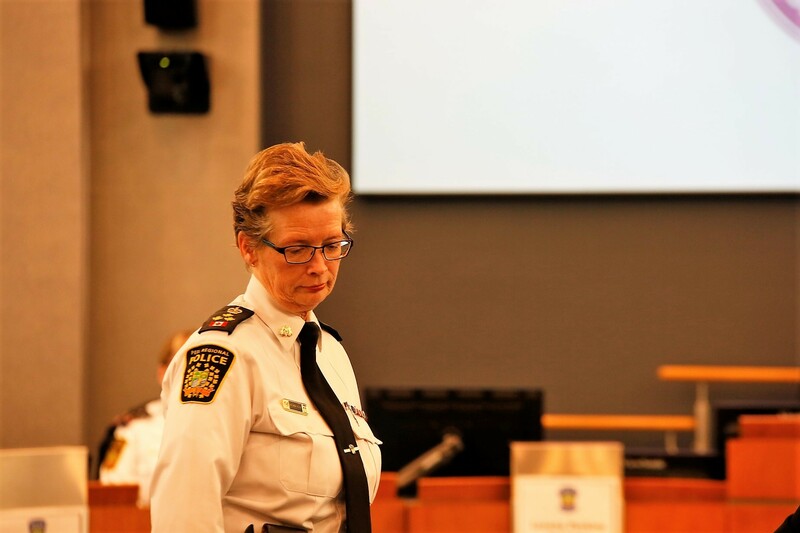 After a busy and bloody year for the Peel Regional Police service, Chief Jennifer Evans wants a massive budget increase and 55 additional officers to deal with a mounting workload and the pressure being put on policing by the region’s ballooning population. Evans, who is retiring Jan. 11 and won’t be around to see the increases come into effect, presented the PRP draft budget to the Police Services Board on Nov. 23, the first meeting of the board after the fall municipal election and the last one before new board members, including Brampton Mayor-elect Patrick Brown, join in the new year. The $423-million proposed budget represents a 5.4 percent increase, or an extra $21.5 million over 2018, and includes several measures to deal with the challenges of a growing population, legislative changes — including cannabis legalization — and the increase in violent crime in the region. The percentage of residents expressing concerns about safety has grown as Peel has experienced a bump in homicides as well as an increase in other forms of violent crime. A poll commissioned by The Pointer in late August asked residents: "Overall, do you feel safer than you did four years ago?" Only 10 percent of those surveyed said yes; 26 percent said they felt about as safe as they did four years ago, and 65 percent said no. Evans wants to hire additional officers in 2019 to help satisfy citizens’ concerns about slow response times. Peel is dealing with a 17 percent rise in the number of calls requiring a police response, as the population continues to tick upward. Of the 55 additional officer positions to be hired at a cost of $8.6 million, 45 would be patrol officers working on the front lines; the remaining 10 would be dedicated to various specialized divisions, including training, IT, intelligence services and impaired driving enforcement. The additional officers would bring Peel Region closer to the provincial average for the number of police officers per capita. Peel currently has about 138 officers per 100,000 residents, while the provincial average is 183 and the national average hovers around 188. The increased staff and cost-of-living increases for current officers together account for the largest line-item increase in the proposed budget. Collective agreements signed in 2015 with the union that represents Peel police officers will bring new pay levels into effect in 2019. As a result, all first-class constables, who only need a high school education to join the force, will find their way onto the so-called Sunshine List of public employees whose salaries top the $100,000 mark. Inclusive of available top-ups, it could mean some young officers only a few years out of high school or college will earn as much as $117,000 a year. Similar agreements in Toronto allow first-class constables to earn up to $107,000. Critics have said Peel police, with a board that in the past rubber-stamped requests from the brass, has not respected taxpayers, while demanding sharp salary increases. Over a 13 year period, from 2006 to the upcoming 2019 deal, the first class constable base pay skyrocketed by 41 percent, from $71,400 to $100,420. It’s a rate that is increasing about twice as much as inflation in the province and critics have said police pay hikes are unsustainable. Policing experts have also pointed out that with so much money going to salary increases, there’s little left over to hire new officers and to purchase crime-fighting technology. It’s part of a continuing trend across the GTA as police salaries rise up toward the six-figure mark. In Peel, there was a 95 percent increase in the number of uniformed officers who made the Sunshine List between 2010 and 2015, from 664 officers (out of 1,855) in 2010 to 1,297 (out of 1,951) in 2015. The increases followed a span of several years when police pay raises lagged behind those for some other government services, according to police association representatives, who have not provided evidence of their claims. The budget ask for 2019 also includes money for several capital projects, including $25.5 million for facilities, most of that ($20 million) to be dedicated to a divisional and operational facility. A further $17.1 million would be spent on new technology and equipment and $5.6 million on maintaining and updating the vehicle fleet. There were few questions or expressions of concern from members of the police board on Friday. Former chair Amrik Singh Ahluwalia questioned the number of new officers required and wondered whether there was capacity to train that many within the Peel police training division and at the Ontario Police College. Evans assured him there was. Outgoing Brampton Mayor Linda Jeffrey raised concerns about provincial grant funding that Evans noted was at risk of being cut off. Under Premier Doug Ford, several grants for police forces across the province have been frozen as the province realigns its priorities. Peel police receive about $17.9 million from the province to help support specific programs that cost about $43.6 million, including the Community Policing project, widely seen as one of the best ways to address rising crime in the region. As is stands, the funding for that project is set to expire in March, and Peel police have been informed their application is currently on hold at the provincial level. Evans noted that if the grant funding were cut off indefinitely by the province, it would have a “significant impact” on the budget, jumping the police budget request to the region from the current $423 million to $441 million. Jeffrey said she had no issue with the requested increase in the number of uniformed officers. A year fraught with issues outside and inside the force has put extraordinary pressures on the budget this year. The region has broken records for the number of shootings in a single year, with 86 as of October, and logged 459 bullets discharged, surpassing last year’s total. At the same time, controversy has dogged internal operations. Just this month, the police service arrested and charged two of its own for criminal offences: a 17-year veteran of the service, charged with several thefts while on duty, and a 19-year-veteran who now faces three charges of assault and assault with a weapon. 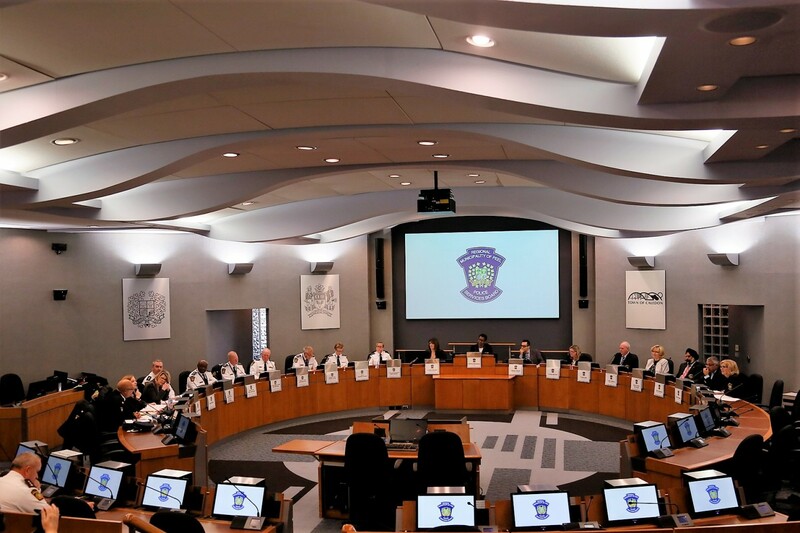 With a new chief to be hired in 2019 and a new crop of members set to take their seats on the Peel Police Services Board, approving a budget that sets the force on the right path to dealing with interior staffing issues and community concerns may be a crucial step toward improving public trust. In The Pointer’s August poll, respondents provided a less than glowing review of the Peel police. When the 999 respondents were asked whether they believed Peel police were ”doing a good job of keeping Brampton safe," some 45 percent agreed, while 38 percent disagreed, and 17 percent answered "don't know." Currently, Peel police maintain a 72 percent solvency rate for violent crimes, which is above the provincial and national average by a few percentage points. With Peel’s surging population, maintaining or bettering the rate of solved crimes will become more difficult. The police service says it will need to hire 55 additional officers each year through 2022 to deal with growth-related challenges in the long term, as well as the potential impact from cannabis legalization in the short term.